Convert FLV to MPEG video files in batches. Xilisoft FLV to MPEG Converter provides you with the fastest and easiest way to convert FLV to MPEG1 and convert FLV to MPEG2 video files in batches for burning them to VCD/DVD disc. If you want to output MPEG1/MPEG2 video files with different resolutions, bit rate, file size and quality, you may find this FLV to MPEG converter is really what you want, with which you can freely split a large file by preset split mode, customize the output file size, extract the video segment you like, and set other advanced parameters. 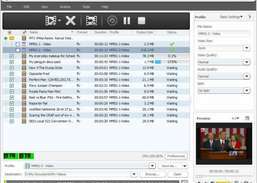 Convert video files from avi, mpg, vob, wmv into avi, asf or wmv files. Convert MP4 files to VOB format.